Stop waiting for permission to live the life you want to live. You have the power inside you to make whatever change you want to make. In April of 2010 my wife and I went on vacation to Maui, Hawaii. We expected to have a good time but we had no idea that trip would end up changing our lives. The moment we stepped off the plane we felt "something" and by the end of that trip we knew Maui would be our home someday. We stayed in Maui for one week. We fell in love with the people, the lifestyle, and of course the food. As we started to pack up to head home we talked about how nice it would be to live in Maui. On the flight home we kicked around the idea of retiring here. You know how it goes. Right? We got home and got busy with everyday life. Eventually even the talk faded away. Life continued on until the death of my father suddenly at the age of 54. I talked about his death in my last blog post here on The Huffington Post. His death was our wake up call to get serious about what we wanted from life. During the planning and eventual move to Maui on April 8th, 2014 I learned some valuable lessons about life. 1. Not everyone will understand. When we got back from that first trip we told our family and friends about our plans. Most said "that's great" but I'm guessing they really didn't believe it. As the planning got serious there were questions. When we finally bought the one-way tickets some just didn't understand. As you make big changes in your life there will be people who just don't get it. That's ok. You're doing what's right for you and your life, not theirs. You can't live your life for anyone else; you have to live it for you. Oscar Wilde said "Be yourself; everyone else is already taken." 2. Hope for the best but plan for the worse. If you're making a big change in your life chances are there's going to be money involved. One of the smartest things you can do is set up a rainy day fund. You hope things work out smoothly but life isn't a movie where things magically work out. Plan for the very likely reality that there will be an unexpected emergency. The experts will tell you what that number should be but I would tell you to have a little more than you think you'll need. When we made the move to Maui, we sold everything and only came here with 15 checked bags. We saved an extra four months beyond what we thought we would need. That first month between replenishing our new home and a few other unexpected expenses we went through $4,000! We were very glad we planned for an emergency situation and you will be, too. Let's be honest, it's hard to wait! We want what we want right now. The problem with instant gratification is that it doesn't last very long. It took three years to make our dream a reality. Waiting taught us to be grateful once we finally got here. Waiting taught us the difference between a quick fix and real change. Patience is hard but if you can persevere what's waiting for you is greater than words can describe. Too often we're so wrapped up in our own little bubble that we fail to realize there's a whole wide world out there with unlimited possibilities. New cultures, new foods, new people, and life-changing experiences can be yours if you're open to change. Adjusting to life in Maui really opened us up to change. It's a slower pace of life here. It's sometimes referred to as "Hawaiian time." You don't encounter things like road rage or people always in a rush. Here you'll find what's called the "Aloha Spirit." Change is hard, but if you embrace it instead of fighting it, you'll find a smoother journey to your dreams. Life is too short to live in a bubble. Open your mind and heart and claim the life you truly deserve. 5. You can't do it all alone. Life can be rough and having a good shoulder to cry on can be the difference between success and failure. A good support system can cheer with you during your successes and talk you off the ledge during your failures. Failure is a part of the journey and everyone fails. The people that are successful in life have figured out that every time you fail you get back up and keep moving forward anyways. If you're going to make a big change in your life set up a good support system. Reach out to family or good friends and let them know what you're doing. Let them keep you accountable and be there for you through the good times and the bad ones. The key is to find honest, positive people. You don't want them to sugar coat it for you but you also can't afford negative people in your life. A negative person can be a dream killer. 6. Your dreams are possible. After my father's death I got serious about living a life of no regrets. It took three years but I lost 170 pounds and left a job I hated to write full time. 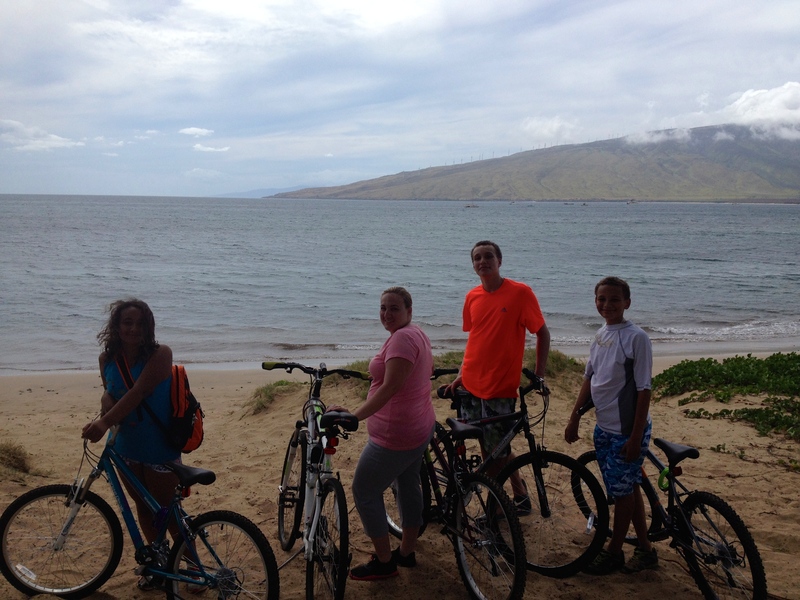 We moved from Milwaukee, Wisconsin, to Maui, Hawaii. I don't have a college degree or any special skills. Three years ago I was delivering bread to grocery stores. If I can do this, so can you. Stop waiting for permission to live the life you want to live. You have the power inside you to make whatever change you want to make. We're not guaranteed a tomorrow. Life is short; it's too short to listen to doubt, fear, and the negative voices of others. Today is the day to start making those big changes that will better your life. Pick yourself. Believe in yourself and take action today. It may take some time but it will be worth it once you reach your victory! What big changes are you making in your life?